One of our best exclusive designs for the basketball player in your family, this glass ornament features a basketball on its way to a swish, accented with glitter and Swarofski crystals. 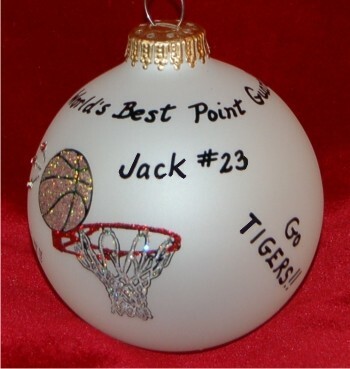 Personalize the basketball Christmas ornament with your custom phrase up top, the player's name and optional number, and the player's team. The personalized basketball ornament arrives in its own box, ready to for gift giving. Under the options banner, you can choose to add another sentiment on the reverse side of the ornament including the stats from a great game, or welcome to the Varsity team or other heartfelt message of accomplishment.